“Eritrea is the country with the least freedom in the world”. These words do not come from someone who opposes President Isayas Afeworki or from the hated government of Ethiopia. Instead they come from an official United Nations paper. The report is produced by a Human Rights Commission which was denied entry to Eritrea but which listened to the testimony of 550 Eritreans and examined 160 submitted papers. It accuses the Eritrean government of “systematic, widespread and grave violations of human rights“, including torture, sexual violence, disappearances and forced labour. Eritrea is described as “The ‘North Korea’ of Africa” where democratic institutions and processes do not exist, nor does press freedom. Military service is indefinite and the country’s relations with all neighbouring states are disastrous. The roots lie in Eritrea’s history. Until WWII the country was an Italian colony after which, from 1941-1952, became a British protectorate, before being annexed by its neighbour Ethiopia (ruled at the time by Emperor Hailè Selassiè). In the early sixties the Eritreans, tired of Ethiopian control, began a 30-year war of independence. The war saw a strong nationalist spirit forged. The efforts of the militia opposing Ethiopian occupation was supported financially by the Eritrean diaspora and international sympathisers. In the 1970s the Eritrean Peoples Liberation Front (EPLF) emerged. Its leader, Isayas Afeworki, while Marxist, remained independent from the Soviet Block which supported Ethiopia. During the Eritrean War of Independence the reign of Emperor Hailè Selassie ended and was replaced by a ‘Peoples Republic’. Meanwhile, the war continued until 1991 when Mengistu Hailè Mariam, the Ethiopian leader, fled the country. The EPLF, allied with a fringe of the Ethiopian resistance, took control of the territory and in 1993, following a referendum held under the aegis of the United Nations Organization, Eritrea became independent. “When Eritrea became independent we thought it would become a new South Africa and that Isayas Afeworki would become Eritrea’s Nelson Mandela” says an Italian who has worked in Eritrea since the 1960s and has supported the Eritrean rebels. “However we were quite wrong”. In the early years of its independence, Eritrea was filled with great enthusiasm. Many of the Eritrean diaspora returned home to invest in activities and reside in the country. The EPLF guerrilla movement became the Peoples Front for Democracy and Justice (PFDJ). Talk of democracy and a new Constitution was followed by the publication of a Constitutional paper in 1997. It was not, however, ratified. This was due, in part, by political tensions and renewed tensions with Ethiopia, following the coming to power in Addis Ababa of a government with a Tigrinya majority. Tensions arose over a failed commercial agreement and a border dispute triggered a bloody conflict that lasted from 1998 to 2000. 150,000 Eritrean and Ethiopian soldiers died in the war. An Independent Commission, the Eritrea-Ethiopian Boundary Commission, was assigned to adjudicate on the border dispute, and concluded its work in 2002. It suggested that that the contested city of Badme belonged to Eritrea. However, the Ethiopian government refused to withdraw its troops from that city. Consequently, long-term tensions between the two countries remained high. Difficult relations with Ethiopia are integral to the maintenance of President Isayas. The president, pointing to the country’s encirclement by hostile powers, argues the impossibility of introducing a democratic system. Consequently his regime continually tightens the meshes of repression, especially towards his critics. In 2001 a group of 15 members of the PFDJ movement wrote a letter demanding democratic reforms, calling for elections and the implementation of the Constitution. The letter attracted the attention of the national and international media. President Isayas was merciless in his response. Eleven of the 15 PFDJ members were arrested, three fled the country and one recanted. Of the eleven arrested, nothing more was heard of them. In the absence of a Constitution the institutional system continued to crumble. Judiciary powers were entrusted to military judges in its penal branch. Community courts to the military’s civil branch. Both remain under rigid government control and the new penal and civil codes are not applied. Parliament, monopolised by the PFDJ, failed to function. The media, pillars of every democracy, was shut down. Today there is no private media in Eritrea and the only existing means of communication are controlled by the dominant Party. Repression is ever harsher. Religious confessions are subject to increasing interference by the political authorities. Officially, Eritrea is a lay State in which religious practice is a matter left to the individual conscience. In actual fact, from its foundation, the EPLF and then the PFDJ, are dominated by Christian Orthodox leaders with unfriendly relations with their Muslim compatriots. During the early days of independence many Muslims were arrested, accused of being Jihadists and a threat to national security. As the years passed, numerous imam and leaders of Islamic communities were arrested for criticizing the government. The same fate befell Jehova Witnesses and Pentecostal communities. In 2002 all religious communities were banned with the exception of Sunni Islam and the Catholic, Orthodox and Lutheran expressions of Christianity. But the Orthodox Church is subjected to increasing pressure. In 2007 Patriarch Abuna Antonios was forced to resign and put under house arrest because of his criticism of the regime. In the current crisis, only the Catholic Church has succeeded in maintaining its autonomous role. In 2014 the four Catholic bishops issued a joint Pastoral letter in which they denounced the political crisis in Eritrean society, citing it as a primary cause of the country’s youth drain. In the letter the bishops list serious difficulties facing Eritreans, primarily the fragmentation of families, whose members are dispersed due to lengthy military service or imprisonment. As a result elderly family members are left to fend for themselves. “All this determines,” the pastoral letter denounced, “a desolate country”. Indefinite military service is the price the country is forced to pay to the aggressive foreign policy of the regime in Asmara. Starting from the year 2000 all young men aged 17 must interrupt their studies and enrol in compulsory military service for “an indefinite period of time”. In military training centres systemic violence by officers are reported. The majority of the young men are considered the property of generals and used as forced labour on public structures. Faced with this situation the boys seek to escape. Many join drug traffickers in collusion with corrupt officers (generals in particular). Statistics issued by international bodies speak of two to three thousand youth leaving Eritrea every month. The figure may be overestimated but what is certain is that the exodus of young men is continual. Eritrea as a country is isolated. Since 2006, the United States has imposed sanctions on the Asmara regime for its suspected support to the Somali al Shabaab militia. With Ethiopia, tension continues, sporadically exploding in armed clashes. A brief war with Djibouti in 2013 triggered tension also with this small state. Tension which has still not subsided. To escape isolation Eritrea joined the Saudi coalition fighting in Yemen against Houthi rebels. 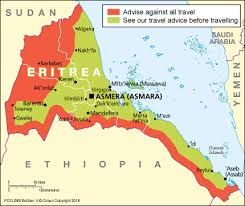 The Asmara regime offered its ports as logistic bases for the ships of Saudi Arabia and the United Arab Emirates. In 2014 it accepted to participate in meetings in Karthoum during which the European Union asks the countries of east Africa to restrain the flow of migrants in exchange for financial aid. But the country remains closed to any form of external influence. Even to the point of refusing international aid during the recent period of drought. What will be its future? It is difficult to say. The risk is that the State may implode bequeathing to its citizens the ruins of what was once a hopeful dream.